Behind every picture is a memory, and I wish somehow I could translate in words just how exciting every catch was. 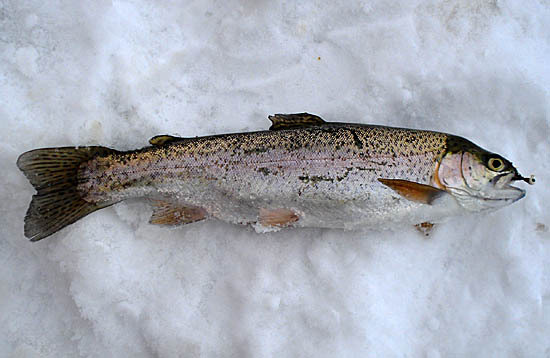 Maybe once I have become more masterful with ice fishing, each catch may not be as meaningful. 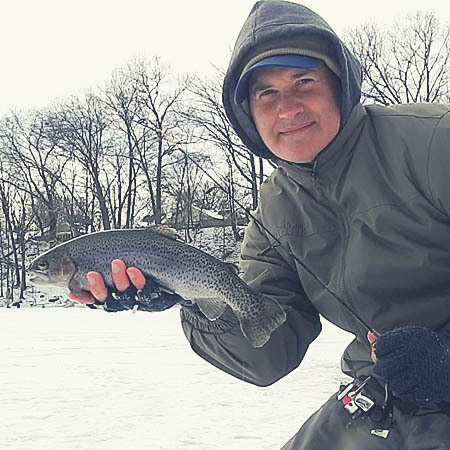 As it stands right now, any fish caught on the ice is a big deal, and the excitement and ‘newness’ of catching through the ice hasn’t worn off. 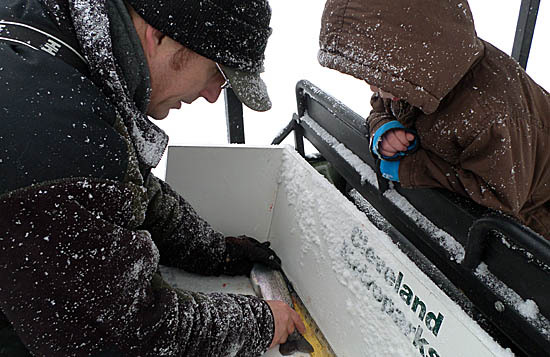 I can understand why ice fishing has it’s own niche of people who specialize in it and consider it their favorite method to fish. My largest fish of the day put up an amazing spirited fight, and trying to get it head first to the hole and then lift out with my other hand was adrenaline packed fun… and this was just a 16″ fish! 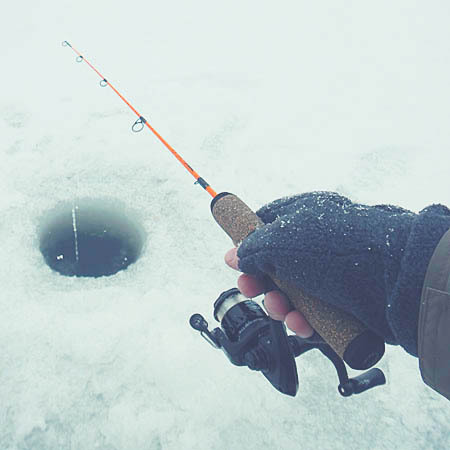 After I got it on the ice, the hook came out and it nearly jumped back in the hole. I scooted it away from the hole and it almost slid into another nearby hole… when I finally got it contained I was beyond relieved and just sat there thinking “how much fun is this?!”. Along with the photos included in this post, I did catch a White Crappie and a Bluegill. I missed a good number of bites, and lost one trout at the hole. I made some new friends with nearby anglers and also got to see what had to be one of the biggest catches of the day anywhere on the lake. 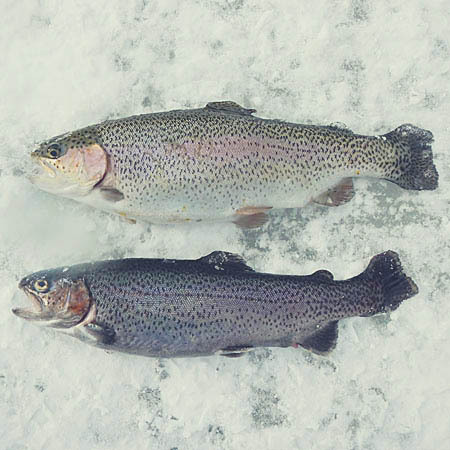 Near the end of the day, a guy near me landed a Rainbow that was a bit over 18″ and it had some shoulders on it. From covering the stocking, I knew the size potential of a few of the best specimen, and he certainly found one. He was stoked over the catch and I have to imagine any angler with a pulse would be. I was excited just getting to see the catch. So there you have it, the most fun I’ve ever had on the ice. I can’t wait to get out again! I have to say NE Ohioans are a hardy ‘hearty’ bunch (Valentine’s Day pun intended). 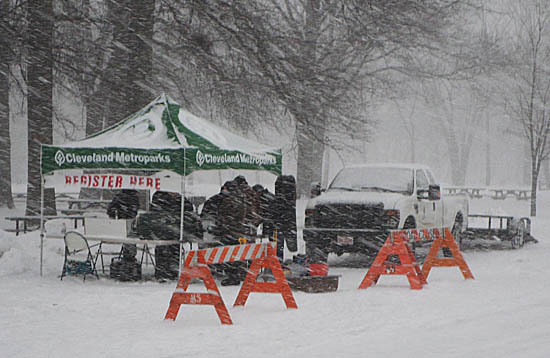 A rather dire forecast of temps, wind, and snow did not discourage the masses from participation in an ice fishing trout derby to benefit the Cleveland Metroparks Fishing Fund. Still somewhat new to NE Ohio and not knowing what to expect, I have to admit I was pretty surprised to see the parking lot nearly full at 8:15 a.m. 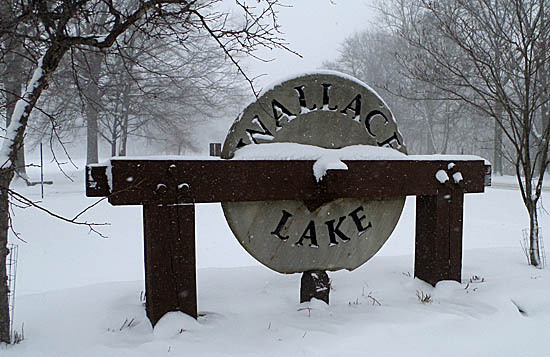 I guess I have a lot of kindred spirits here that wouldn’t let the holiday or weather keep us from fishing. 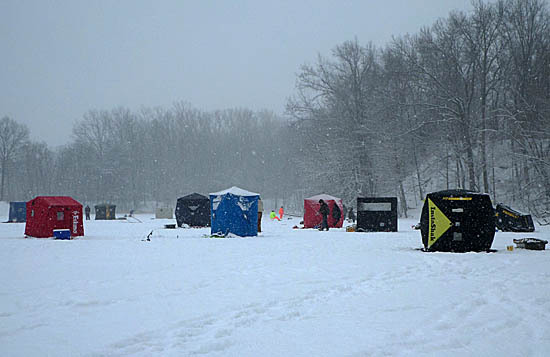 The event format was straightforward and very organized, registration from 8 to 9 a.m., fishing from 9 a.m to 2 p.m. and have your longest trout measured by a roaming crew of staff. A good selection of bait was offered for sale on site, which I thought was a nice gesture to encourage novices and others who may not be well geared or prepared. I also want to mention that everyone from park staff, rangers, police, and even fellow anglers were very friendly. Anyone with perceptions or stereotypes of urban areas would have had those shattered today with the amount of camaraderie I experienced and witnessed. I was on the ice about 30 minutes before the start horn would be sounding. 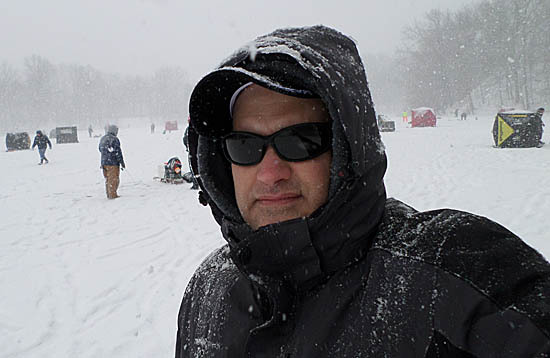 Of all the fishing types I do, those that follow this blog with some regularity know that I am not a very good or confident ice fisherman. In fact of all the types of fishing I do, it is easily what I have the least success with. So I wasn’t going to over think where to drill holes, or come up with some crazy creative idea of where to fish. I saw where everyone was, and simply chose a reasonable and respectable distance to set up. While I was a little disappointed I was in an area only about four and a half feet deep, the Aqua-Vu camera showed some submerged branches and it looked ‘fishy’ enough on the monitor to try my luck. The next 20 minutes was spent talking with nearby anglers as we all waited for the starting signal. There was some healthy bantering between some of the people, likely locals who knew each other, but I had no problem jumping right in. One of my contributions was a young lady who complained about being cold as she sat outside of the Shanty her group had brought. I mentioned that being in, opposed to next to the Shanty, would prove to be warmer. Her reply, “well I want to watch what’s going on!”. With all of the conversations, time flew by and soon enough it was time to get down to fishing business. I had a small jig tipped with two waxworms on one rod and a jig tipped with trout worms on my other. No more than 90 seconds after the horn sounded, I looked up to see a local (Brian) hooked up and landing a small Rainbow Trout no more than 30 feet from me. Returning to my own task at hand, I saw three Rainbows on the Aqua-Vu monitor. I was sure I was the next to catch a fish, however, all of the fish in view showed no interest in my offering. This scenario would play out multiple times over the next few hours. I was simply seeing too many fish to move, yet I was unable to trigger a bite. When I finally decided to switch to Powerbait, the weather took a dramatic turn for the worse. 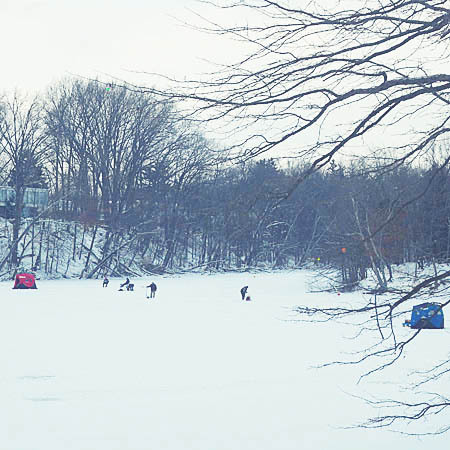 Rather intense snow and wind, found me huddling over my holes, with no desire to re-rig. 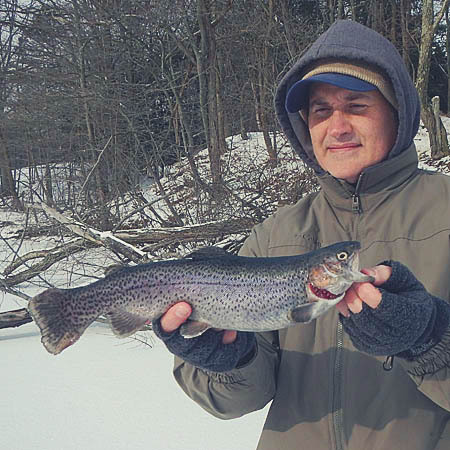 While I would catch no fish, plenty of others had success throughout the morning around me. In fact, I would say more people caught fish than didn’t. I was happy to hear people cheering when a fish was caught, and many of the people that I had gotten to know through conversations earlier kept me in the loop with what was going on. I learned of a girl who caught her first fish ever, many youngsters having success, and plenty of savvy veterans catching numbers of fish – seeking to constantly upgrade into a prize winning catch. 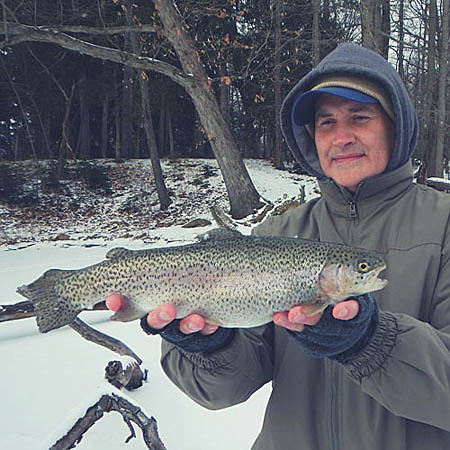 The photo above of Mike Durkalec, Cleveland Metroparks, measuring a nice trout would be an example of one of those savvy veterans, Brian Kich, who put on quite a fishing clinic. He had to catch & release as his success took him within one of his limit in the first 45 minutes of the derby. At the time, the above fish qualified as 3rd on the overall leaderboard. Sadly, there would be no prizes for the author, in fact there wouldn’t even be a single catch. 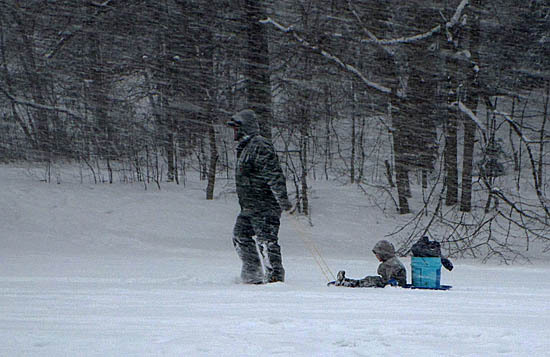 The photo above is so you know the exact person who needs to have his ice fishing man-card revoked or maybe you’ll know who to come up to and say, “my four year old with a Snoopy Pole outfished you”. 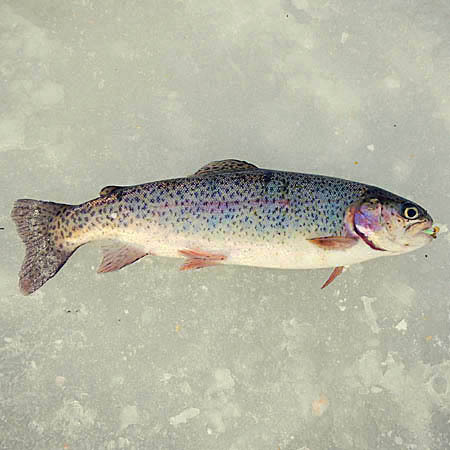 My other thought is to make a silkscreen of the photo and have it slapped onto a T Shirt that reads, “I went to the Cleveland Metroparks Trout Derby, and all I got was this lousy selfie”. In all seriousness, I had a great time and it was a fun event. Bravo to the organizers and attendees. 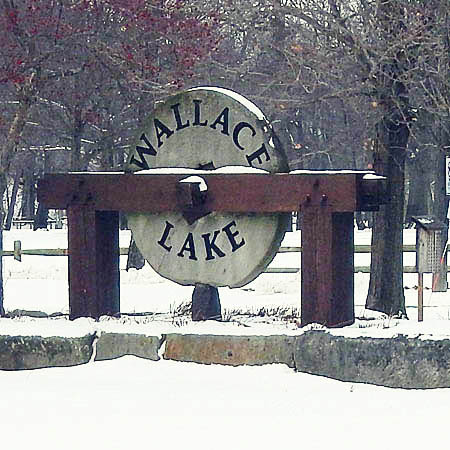 To the fish in Wallace Lake, in my best Schwarzenegger voice, “I’ll be back”.